Unsurprisingly, quite a lot of our physical game releases ran out of stock during the Christmas/New Year period - but at the time of typing, most of our back catalogue is again available to purchase, including Yoomp! 64 (which hasn't been in stock for a few months)! Note that Rocket Smash EX (C64) and C-2048 (C64) will be available again soon (I'm awaiting a delivery from Tim at Sharewareplus). Also, our planned back-catalogue reissues continue this year, with Georg Rottensteiner's one or two-player arcade-style eat-em-up Get 'Em DX (C64) currently being worked on. Expect more news on this one at the end of the month. An unknown militarized terrorist unit, known as the X-Force, has occupied the peaceful city of Suburbia. As the top pilot in the Earth Defence Force (EDF) the job of defeating the terrorists falls to you! Grab your joystick, save the world, and see if you can get that all-time high score! High octane 50/60 FPS SHMUP action! 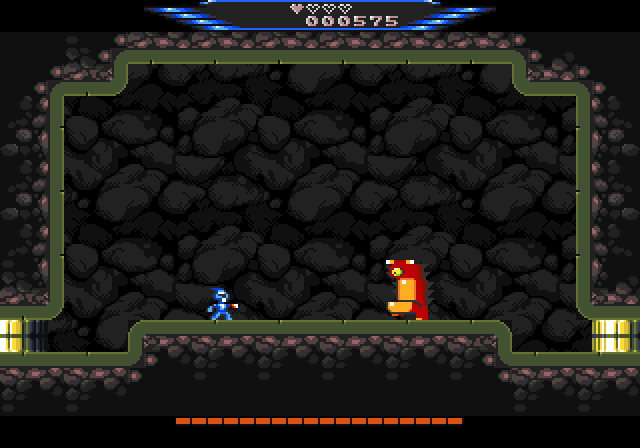 All new background and sprite graphics! Bosses at the end of each level! Three difficulty levels, auto-fire and more options! 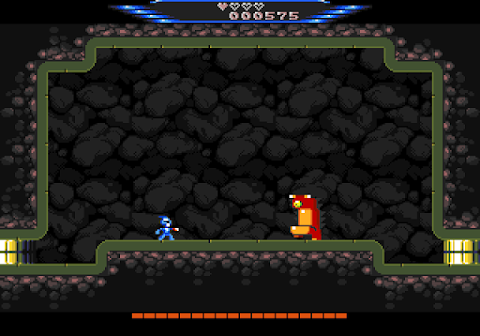 Upgraded sound and bomb effects! High score list and options saved to cartridge and disk! Developed by Mark Hindsbo, Saul Cross and Thomas Petersen, AVIATOR ARCADE II is arguably one of the best vertical shoot-em-up games available for the Commodore 64, offering players a console quality arcade experience on the humble 8-Bit home computer! 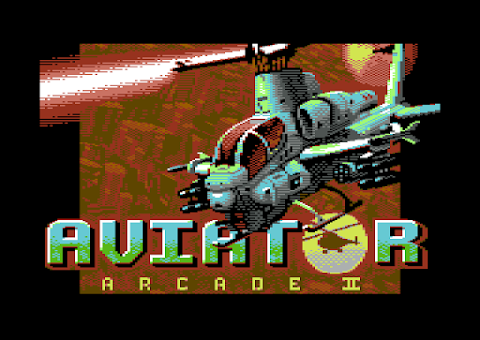 AVIATOR ARCADE II is a Psytronik and RGCD Production. Download the game demo HERE (itch.io) (complete with VICE for Windows, macos and linux). The full version is available for $2.99. Buy the game on disk HERE for £6.99/13.99 (Psytronik Software). Buy the cartridge HERE for £36 (RGCD). Without an energy supply the death of billions is imminent! We need the six control diamonds to engage the station's backup systems. Use the shielded suit and the Powerglove to protect you against the maintenance robots. 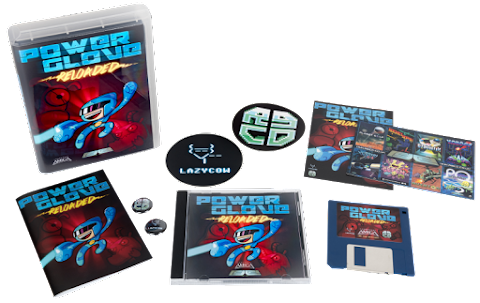 Powerglove Reloaded is a classic-era run 'n' gun game developed by Lazycow and Pierre 'Cyborgjeff' Martin for the Commodore Amiga home computer. Based on the 2014 Commodore smash 'Powerglove', this enhanced port features improved graphics, a larger game map, deeper game mechanics and even boss fights! Guide the hero through the polar thermal reactor complex, navigate the complex network of transport tubes, locate the six control diamonds and blast away every rogue robot that stands in your path! Classic run 'n' gun action over six huge maps! Seven types of fiendish mechanical monsters to vanquish! Cool stuff to collect (including Powerboots & Charge Shot)! 'Classic' mode with chunky C64 graphics! 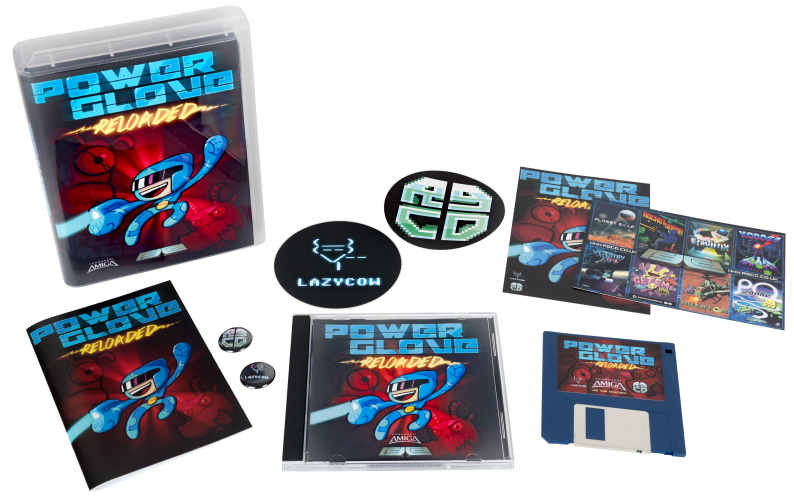 Powerglove Reloaded is available for Windows, MacOS, Linux and the Commodore Amiga (1MB RAM), both in digital format and as a physical release. Visit Lazycow's web site for full details on the game! Download the game HERE (itch.io) for Windows/MacOS/Linux (FREE/pay-what-you-want). Amiga version available for $2.99. Download the game HERE (itch.io) for Commodore 64 (FREE/pay-what-you-want). Buy the Amiga physical release HERE (RGCD) for £15/16. Buy the Commodore 64 physical release HERE (RGCD) for £28. Help TIGER CLAW kick and punch his way through 24 screens of martial-arts mayhem to retrieve the four mystic scrolls before Fire Fist, Thunder Chain and Angry Tongue can reveal their true potential! TIGER CLAW is a relentless beat 'em up game developed by Lazycow and Saul Cross. 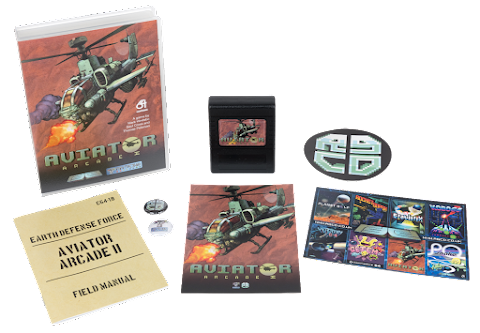 Originally released exclusively on Commodore 64 cartridge by RGCD for backers of the C64 in Pixels Kickstarter (Fusion Retro Books, 2016), then ported to Windows, MacOS, Linux and the Commodore Amiga in 2018! TIGER CLAW was initially released as an entry in the 2014 RGCD 16K C64 Game Development Competition (where it placed 2nd out of 17 entries). Taking player feedback into consideration, the game was both further expanded and refined for the 64KB final, including the addition of extra rooms, foes and features, an arcade-style training mode and a 2-4 player deathmatch arena! 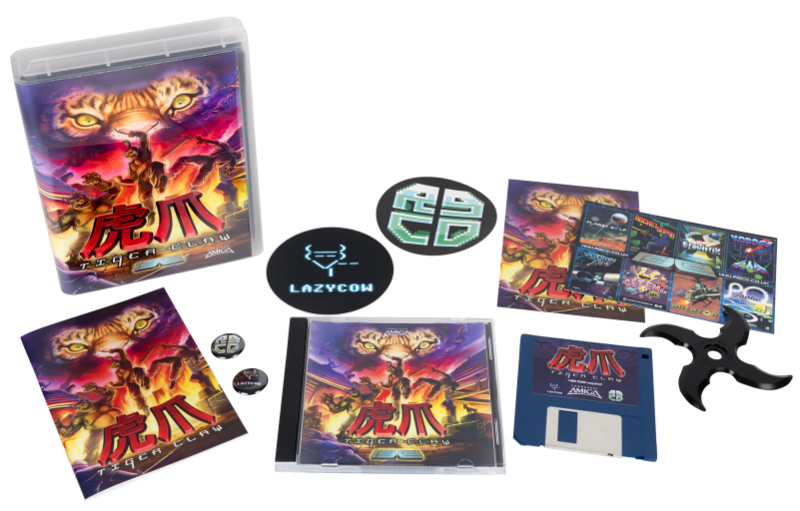 In December 2018, a new version of TIGER CLAW was made available for Windows, MacOS, Linux and the Commodore Amiga (1MB RAM), both in digital format and as a physical release. Kill your friends in deadly 2-4 player versus battles! Smash your way through the arcade-style training mode! Collect ancient masks to gain new powers! Slay dozens of enemy foot soldiers, deadly ninjas, fearsome daemons, rabid hounds and birds of prey! Full NTSC/PAL support (both on Commodore 64 and Amiga)! Download the game HERE (itch.io) for Windows/MacOS/Linux and Commodore 64 (FREE/pay-what-you-want). Amiga version available for $2.99. A belated Happy New Year to you all! The last couple of months have been insane here at RGCD; since the release of Aviator Arcade II (C64), Powerglove Reloaded (Amiga) and Tiger Claw (Amiga) in early December I have been swamped with over 250 orders, most of which were for multiple games. 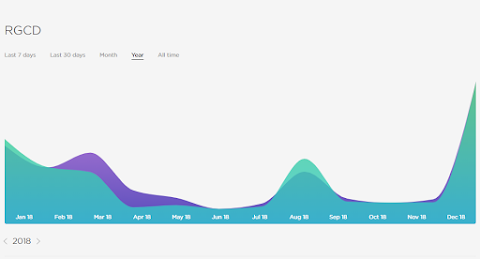 As you (probably) know, all our releases are hand assembled and packed by myself, Jamie and (in the case of most C64 releases) Tim in our spare time outside of our real-life jobs - and as a result I've only in the past couple of weeks caught up with the backlog. Phew!